My husband and I absolutely drool over this dish, and the super-deluxe added bonus is that both of my girls eat it heartily, too. They have nearly opposite food preferences, neither of which align nicely with mine or my husband's, so most nights someone is disappointed at dinner. While I won't by any means call this healthy, it feels much more indulgent than it actually is. Make it for dinner tonight. Thank me later. Start pasta cooking according to package directions. Making the sauce should take about as long as it will take for your water to come to a boil and your pasta to cook. Before you drain the pasta, reserve about 1/2 cup of the starchy cooking water. While your pasta is cooking, make the sauce. In a medium saucepan, melt butter over medium-low heat. Once melted, add garlic and saute for an additional minute. Add flour and cook, stirring, for 1-2 minutes, until flour just begins to brown. Add milk, about a 1/2 cup at a time, whisking constantly, until thickened. Add parmeasan cheese and stir until melted. Pour sauce over pasta, along with salt and pepper to taste. If sauce seems too thick, add a splash of the reserved pasta cooking water. 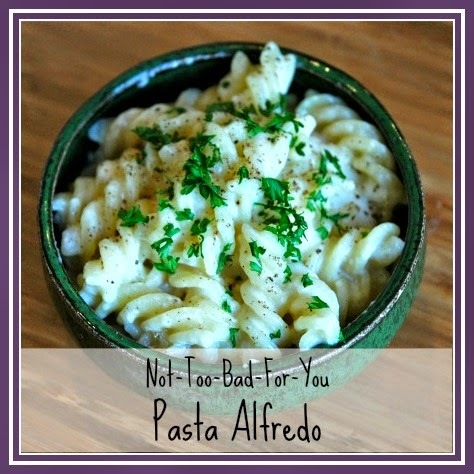 Pasta Alfredo with a healthier sauce. Still delicious, without all the calories!